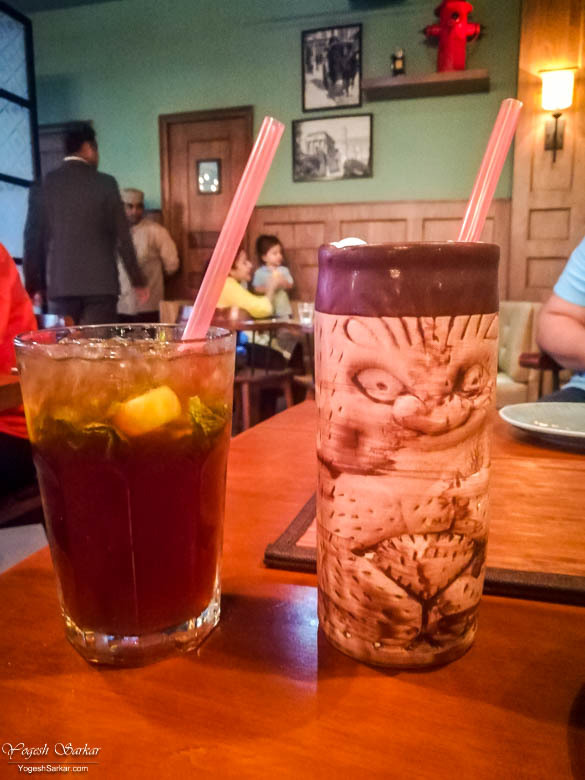 United Coffee House, first conceptualized 76 years ago, has stood the test of time and has been drawing patrons, both old and new, at its Connaught Place and other outlets. 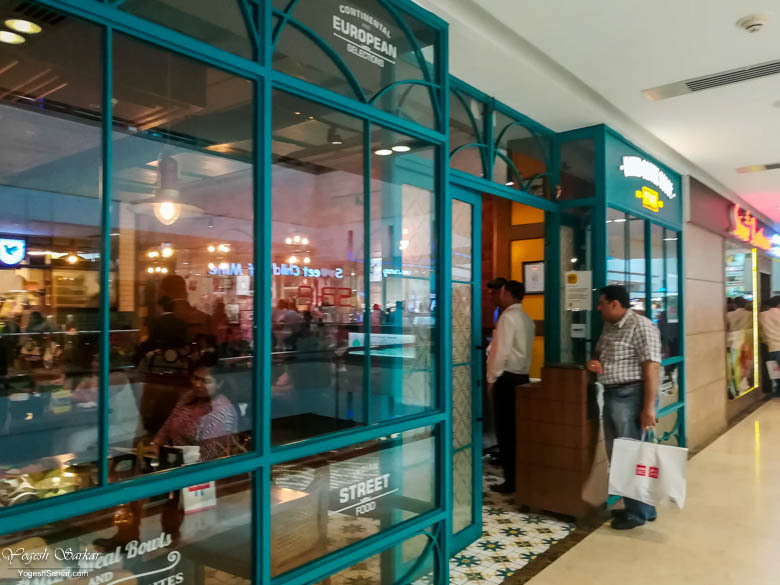 It is quite another thing I never visited one, until this weekend, when I went to the United Coffee House Rewind at DLF Mall of India in Sector 18, Noida. 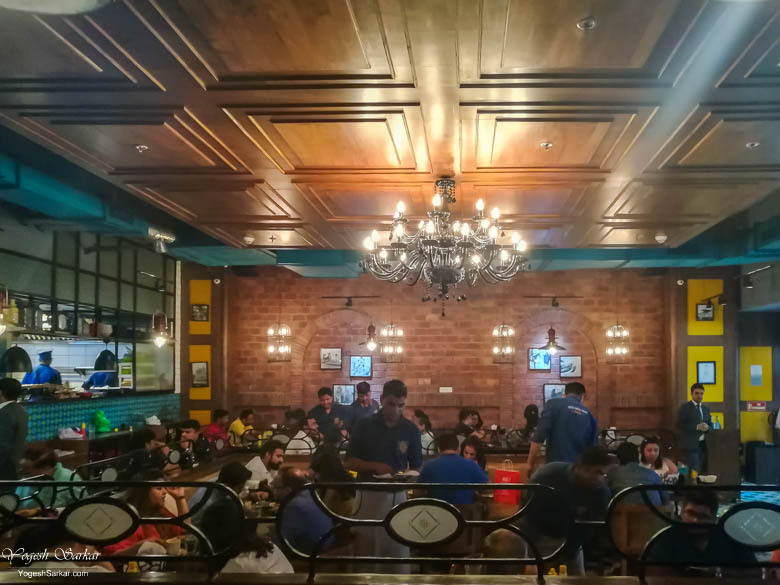 Located on the third floor of the DLF Mall of India, United Coffee House Rewind was packed to the brim on Sunday late afternoon and we had to wait for 5 minutes before we got the table. 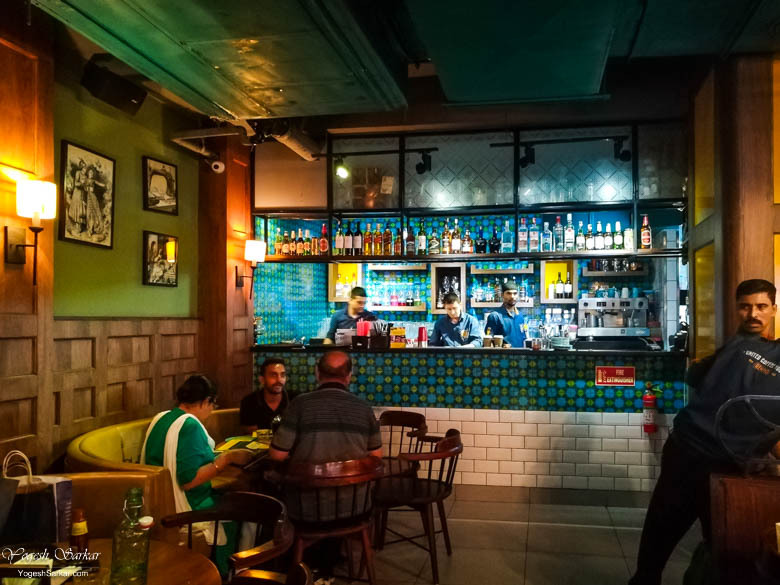 The décor was beautiful and elegant, though the Bose speakers were blaring out music a tad loud for a lazy Sunday afternoon and that coupled with a noisy restaurant, made conversations a little difficult. The service, on the other hand, was good, especially considering the restaurant was jam-packed. 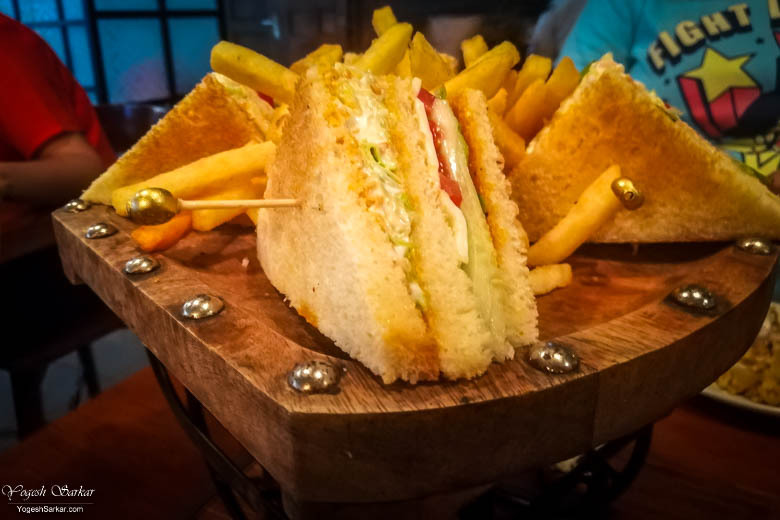 For our late lunch, we ordered Mac and Cheese Pakora Fitters, Vegetable Cordon Bleu Sizzler, The UCH Club Vegetarian Sandwich, Bromley Apple Pie, Virgin Pina Colada and Italian Smooch. We had ordered Virgin Pina Colada with Cranberry flavor and while Mansi liked it (she ordered it), I didn’t like it at all. The Italian Smooch (lemon chunks, brown sugar muddled with ginger ale and topped with coke) on the other hand was deliciously refreshing, though a little too sweet. Mac and Cheese Pakora Fitters were heavenly. 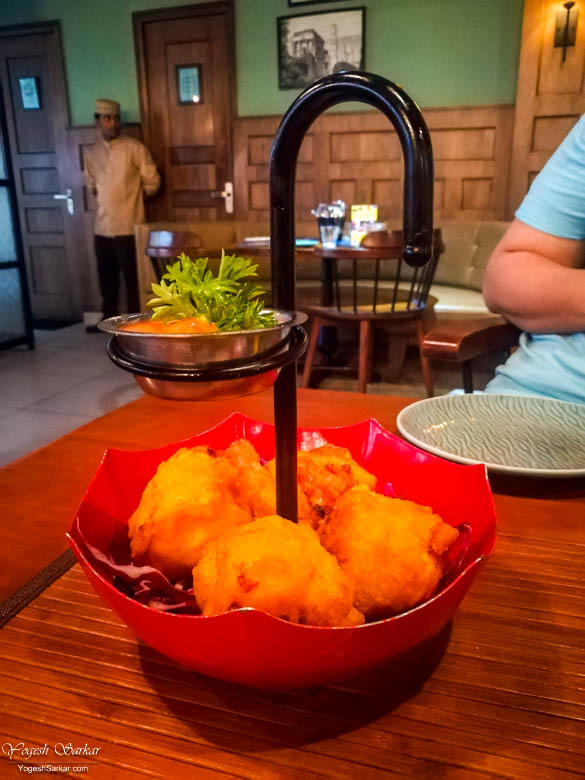 The melted cheese along with macaroni stuffed inside crisp pakodas that felt light, despite being fried and with just the right fusion of flavors to elevate the taste of Mac and Cheese was the best thing we ordered at UCH Rewind. 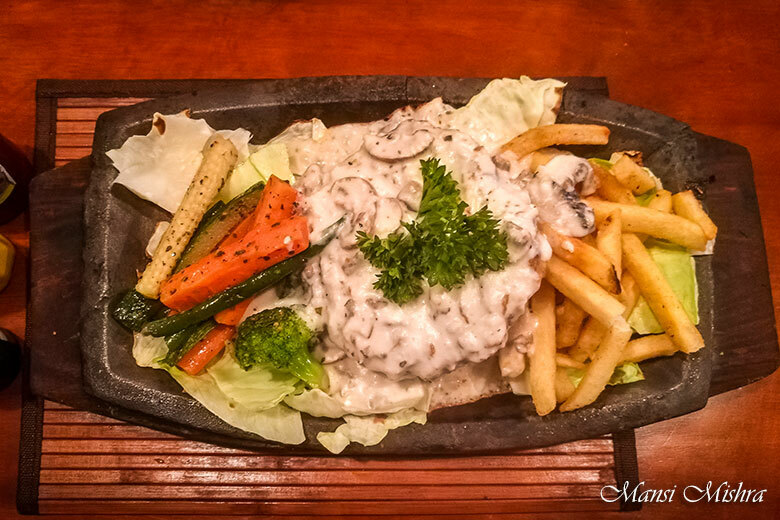 Vegetable Cordon Bleu (vegetable patty sauteed in French white wine topped with morney cheese sauce and served veggies and fries on a sizzler) was disappointing. Although the patty was good and delicious, it neither had the smoky flavor of the sizzler nor any exoticness. The UCH Club Sandwich, on the other hand, was good and the presentation was quite nice. The Bromley Pie, which was served with vanilla ice cream was delicious but really sweet. 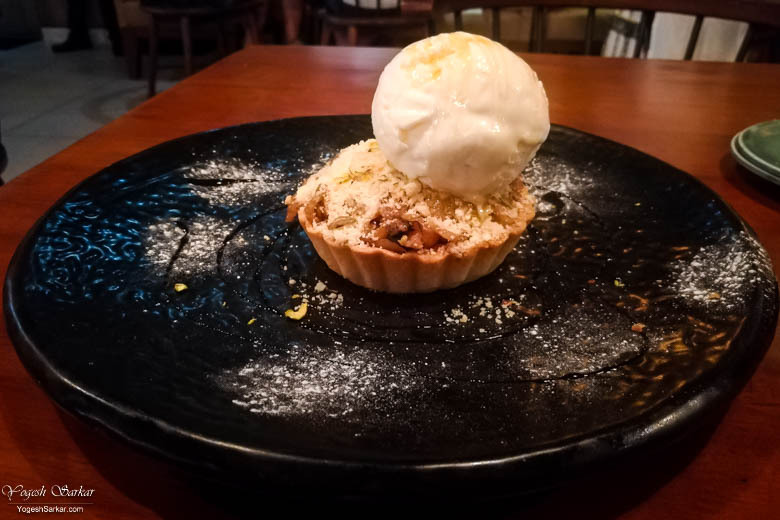 Then again, it went nice with the scoop of ice cream it was served with, but without ice cream, I couldn’t enjoy it, though I did like the little bit of sourness produced by the apples and the fact that pie was warm and the crust quite crusty. Overall, we enjoyed our lunch at the United Coffee House Rewind, though some of the dishes could have been better. Especially considering we had to shell out Rs. 2,442 (inclusive of taxes and 10% service charge) for Mac and Cheese Pakora Fitters, Vegetable Cordon Bleu Sizzler, The UCH Club Vegetarian Sandwich, Bromley Apple Pie, Virgin Pina Colada and Italian Smooch.